I promise that getting your playroom organized and keeping it that way isn’t as tough or overwhelming as you think. 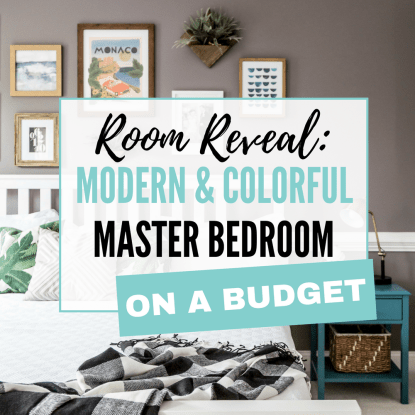 With a little patience and some great storage solutions, you’ll be on your way to turning said playroom into a Container Store ad in no time. All right — let’s do this. Take a deep breath, put on your favorite Spotify playlist, and let’s get to work. I recommend you tackle this project either 1) when no one else is home or 2) once your kids are asleep. Trust me when I say organizing your space will be a whole lot easier if you’re by yourself. If you’ve ever tried cleaning your house with kids underfoot, you know exactly what I am talking about. Step One: Declutter, declutter, declutter. Maybe it’s just me, but I love throwing stuff away. Seriously, it’s so liberating, especially for type-A people like myself. 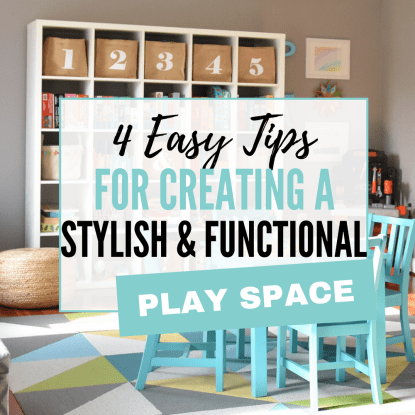 Before you get to organizing, it’s essential to weed out all the stuff that’s taking up valuable space in your playroom that your kids no longer want or need. And even if you cleaned recently, I’ll bet you money that something you don’t need is still lurking in the bottom of a playroom bin somewhere. I recommend you make two piles when decluttering: one of things to throw away and another of things to donate or sell. 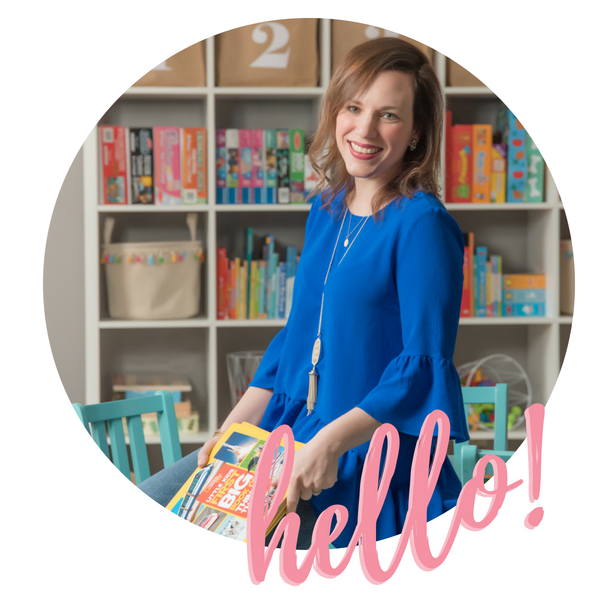 To jump start your decluttering, I wrote an entire post about it that even includes a printable checklist of 39 things to purge from your playroom right now. So go grab your checklist, print it, get rid of all the junk you don’t need, and let’s keep moving. Or, let me make your life even easier — just fill out the form below and the checklist will be delivered straight to your inbox. Step Two: Put ALL the remaining items out in the middle of the room. Yes, you need to be able to see EVERYTHING that needs to now find a home somewhere in the playroom. 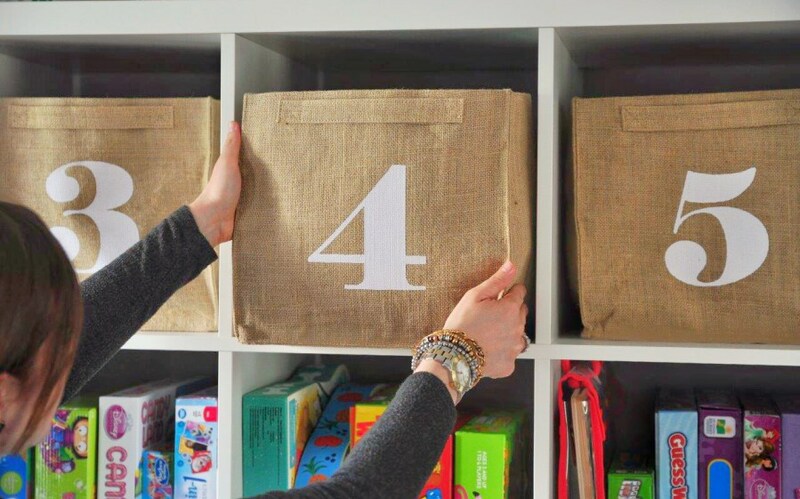 If it’s easier, move all your storage baskets and bins out of the room and place them in a designated staging area. You’ll come back to these later. Step Three: Categorize all your items by grouping like items together in piles on the floor. Okay, now the fun part begins. Group like items together in piles on the floor. So put all your books together. All your games and puzzles together. Keep the craft supplies and coloring books together. Make sense? Keep doing this until you’ve categorized nearly every item in its rightful pile. If there are a few stragglers, that’s okay. Step Four: Review the items category by category and determine what kind of storage you need for each collection. Stand back and look at all the piles you’ve created. Now take note of what you have and how much of it is sitting in front of you. Grab a notepad or your phone, and start jotting down the categories. 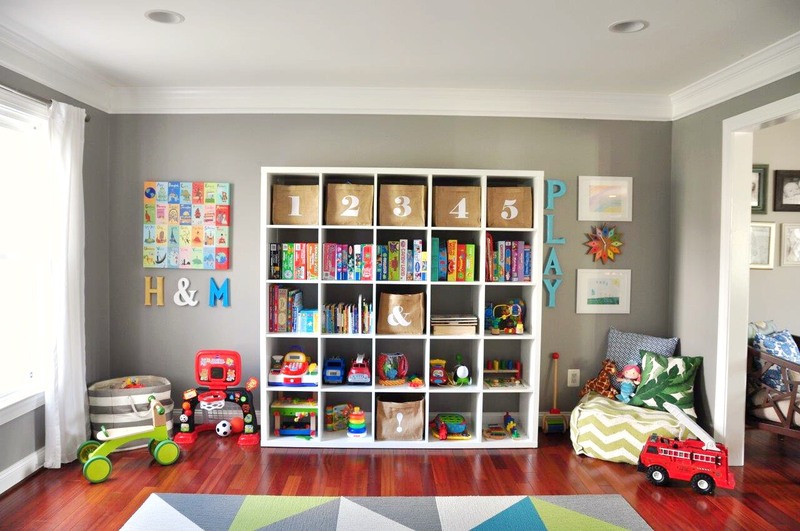 This is the list that’s going to help you determine the best storage solutions for the items that you need to house in the playroom. The more specific you can be with your notes, the better. How many Matchbox cars do you need to store? Do you have smaller Barbie dolls or larger American Girl ones? 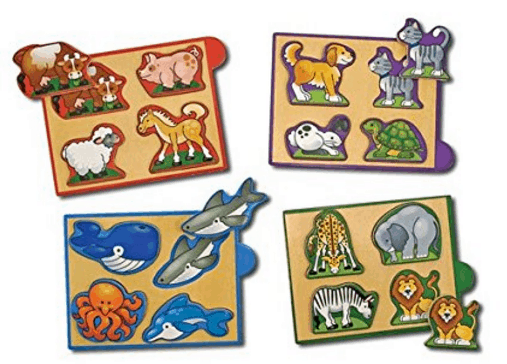 The quantities and sizes of the various objects matter, and if you jot these down you’ll have an easier time identifying what kind of storage solutions you need for each category of toys (that’s step five). 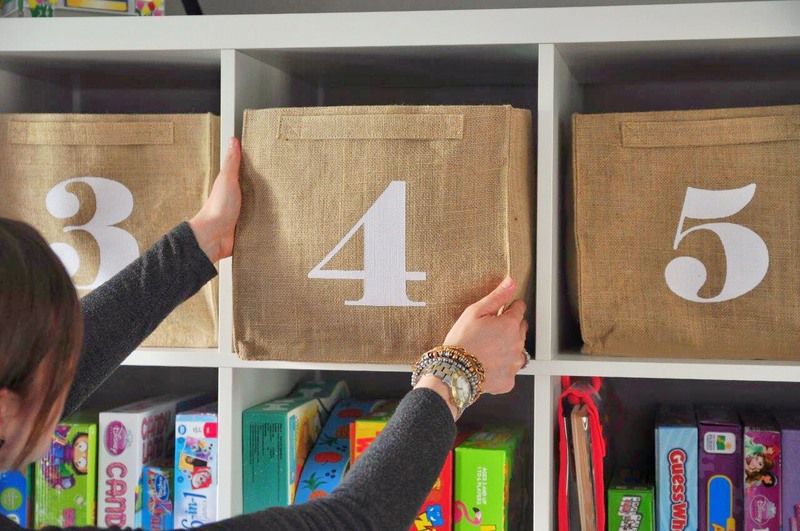 After you make your list, it’s time to go grab all those now-empty storage bins and bring them back into the playroom. Step Five: Re-organize your space using the storage options you already have, OR go purchase new storage options if you don’t currently have something else that will work for you. It’s great if you can use the bins, baskets, and shelves you already have, but if you find that there are some categories of toys that just won’t fit nicely into what you own, don’t force it. 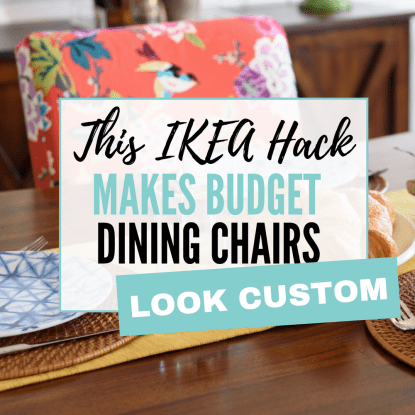 For example, we somehow wound up with a ton of play food items, and instead of trying to keep it all in a single bin we decided to use the IKEA Raskog utility cart. At $25, it is SUCH a steal and works perfectly to corral all those pretend apples and bowls of mac ‘n cheese. Unfortunately, the bright turquoise version that we have is no longer available, but I’m happy to tell you that Michael currently offers something in a similar color. Trust me — if you try to fit a square peg into a round hole, so to speak, you’ll just get frustrated over time and end up having to tackle the clutter all over again. 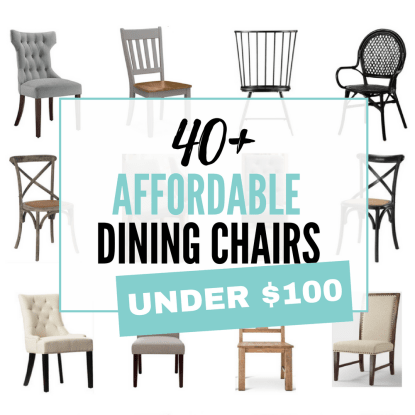 So don’t be afraid to explore some new options that work best for your newly organized space! Of course, the catch-22 here is that as your kids grow older and their interests change, you’re probably going to have to go back and do this all again. But now that you’ve been through the process once, you know that it’s actually not that challenging. And can we all agree that we feel so much better once everything is organized and in its rightful place? Now, I know you might be reading this at work, at the gym, or even as you’re waiting in the school carpool line. 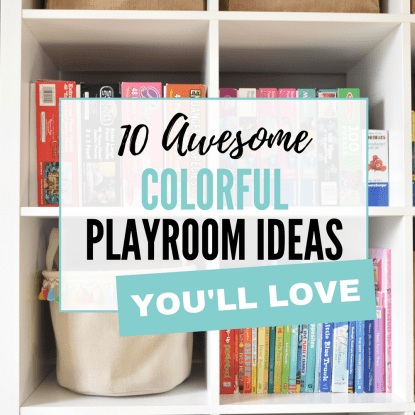 So if you’re not ready to get started right this second, why not pin this for later so that you’ll have these tips on hand when you’re ready to conquer the playroom craziness? Thanks, Lisa! 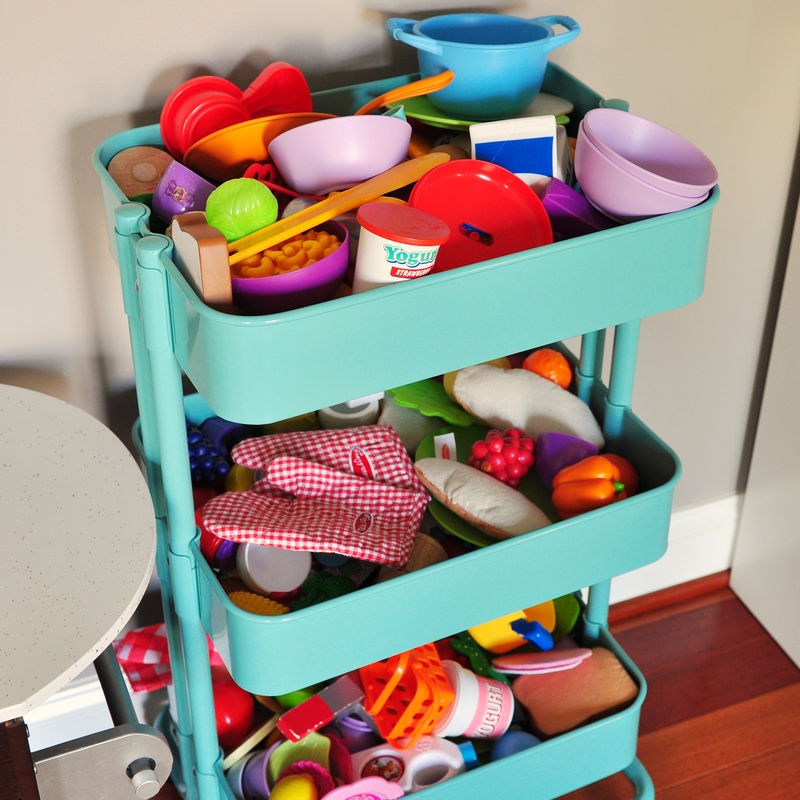 Yeah, I never would have thought of buying that rolling cart for playroom storage, but when I was thinking about how i was going to store all of that play food, it ended up being the right choice! Yes, and the color goes great too! I will remember this when creating our “playroom” space! Hey there! Yep, those bins are indeed from The Land of Nod. Sadly, they are no longer available and I guess LoN now offers the “A, B, C” ones in their place. Sorry to be the bearer of bad news! That said, I love their storage bins. We have several varieties around the house, including those canvas ones and the “Stripes Around the Cube” bins.